CRICKET: He troubled the Queensland Bulls with seven wickets in the Sheffield Shield game for New South Wales in Brisbane in November. Tonight, Trent Copeland will be looking to repeat the dose for the Sydney Sixers against the Brisbane Heat at the Gabba. 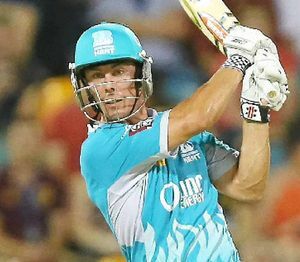 He will need to be at his accurate best against a Heat side containing dangerous batsmen such as Craig Kieswetter, Luke Pomersbach, Chris Lynn (pictured), Joe Burns and Ben Cutting. Pomersbach will be looking for a big score after managing a total of 29 in his past three games. Both teams will be desperate for a win after losing their previous encounters, the Sixers to the Stars, and the Heat to the Renegades. Brisbane's bowling attack has misfired in the past two games, conceding 420 runs off 40 overs. Heat captain James Hopes (abdominal strain) will be given until today to prove his fitness. Is this cricket's greatest catch ever?